Oilheat from Hunts Point Fuel and Brite Fuel is the best choice a New Yorker can make for home heating. Oilheat is the leading value. In 12 of the 17 years from 1992 to 2008, the average annual price of Oilheat in New York was lower than the annual average price of utility gas, according to the U.S. Energy Information Administration. 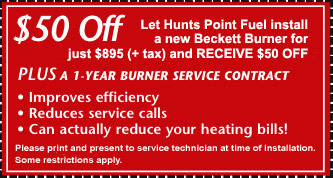 Hunts Point Fuel and Brite Fuel offer a comprehensive range of heating services, including emergency service, preventive maintenance, conservation advice, cost management programs, equipment installation and more. We meet all your home heating needs, we're accountable, and we treat you right. We are the kind of company that you can enjoy having as a partner. We're friendly, family-owned and local, with thousands of loyal customers who speak highly of the service we provide. We offer automatic delivery, so you never have to worry about running out of fuel. Hunts Point Fuel and Brite Fuel have teamed with an approved ESCO (Energy Service Company) and are now bringing natural gas and electricity to homes at incredibly low prices. And, there's no need to change anything on your end — except spend less money! You'll continue to receive one easy-to-understand bill from your utility company. There's no penalty for receiving your natural gas or electricity from our program, only the benefit of great prices. There won't be any disruption to your current natural gas or electric services. As our services expand, our primary goal to save our clients money and provide the highest level of customer service expands as well. Our dedicated team will continuously monitor the natural gas market for the best available prices, and we'll offer the best possible rates on electricity. We provide fixed price guarantees and budgets for one to three years, and there's always the option to purchase at low market price on a daily or monthly basis. If you're ready to see big savings on your electric or natural gas utility bills, contact Hunts Point Fuel and Brite Fuel and schedule your natural gas or electricity audit today. 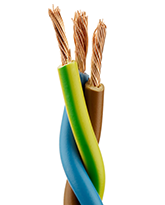 Our master technicians also install advanced equipment from some of the world's top manufacturers. Our work is meticulous, and we adhere to the manufacturer's setup requirements so that your new system achieves optimal performance and efficiency. Here is a look at two manufacturers that we represent. R.W. Beckett Corp. has been making oil burners in Ohio for more than 70 years. Their burners are found at the National Science Foundation's McMurdo Base in Antarctica, where temperatures falls below minus-50 degrees, and in the Statue of Liberty. Beckett designs equipment to provide years of reliable service, and their burners are found in more North American homes than any other brand. Peerless is one of the world's leading manufacturers of cast-iron boilers. High-efficiency models that achieve the ENERGY STAR® rating will reduce fuel consumption and save money. All Peerless boilers feature an insulated, enameled steel jacket that reduces heat loss.